Freestyle stunt rider "Killer" Kenny invites us down to watch while he gives a few tips to local riders the day before the Round 4 Race of the TERRA Championship Series. It was a big Saturday for our media team, just that morning we were invited down by the ADRAD Sprintcar team to film a photo shoot with our presenter Tamika Barnett and Australian motorsports photographer Wade Aunger. That same afternoon we were lucky enough to get the inside scoop on local Darwin stunt rider 'Killer' Kenny Watkins who was kind enough to let us film him at Hidden Valley during a closed prep session. Ed Forman and Auki Henry went down armed with one of our video cameras, a tripod and a hilux ute to grab some footage of Kenny in action. We hope to grab more of Kenny in future as there has been a lot of interest shown in the motorsports community to use him for events and public appearances. 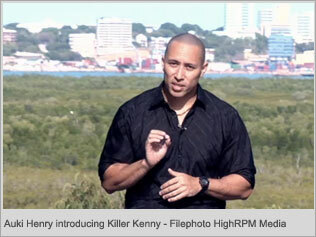 "Killer" Kenny the Stunt Rider | HighRPM Spotlight from High RPM on Vimeo.